"Dawn here again, from Yorkshire UK, with an entry for the June Challenge. As luck would have it, there were some beach scene stamps as a free gift with a magazine this month ("Simply Homemade" magazine; stamps by www.emmaball.co.uk), so I thought I just had to use some of them to make a card for the Beach Scenes challenge - hope you like it." There is just 2 days left in our Beach - "a bit of sand and water" challenge. You can email an entry just as Dawn has done if you do not have a blog or Split Coast Stampers account. You may enter up to three times (we love to see your creations! 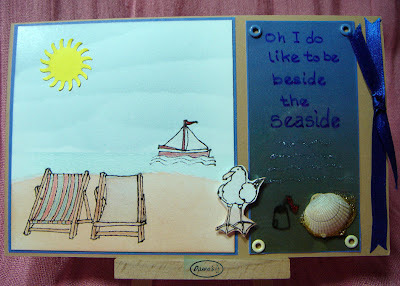 ), but you must create a scene with images and the project must be completed (no unmounted work or ATCs). I'll be back on Saturday with the winners for this month!